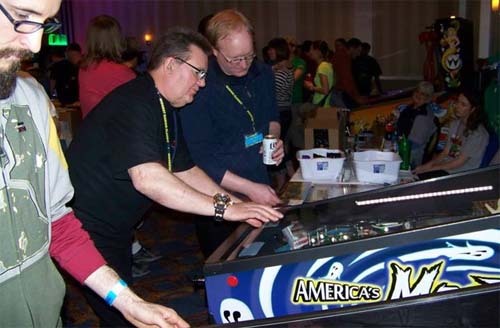 We won “Best Custom Game” at Midwest Gaming Classic, yahoo! Getting back to work on code, not going as full-bore as last week, still, stuff needs to get done! Fixed this bug by turning it into a “feature” Normally it takes 3 hits to defeat Army Ghost. If multiball active, you can hit him as many times as you want until you’re down to one ball, in which case final hit ends mode. This would allow for many more jackpots than mode currently provides. Strategic! Added a prompt if you hit Call Button when it’s disabled “Collect Jackpot to Enable Call Button” Always tell players WHY they can’t do something / why it doesn’t work. Found some states where ball will remain trapped if a Tilt occurs. Planning to debug those out next. Is that special diy engineering juice in your hand?